In a small bowl, whisk together the soy sauce, apple cider vinegar, maple syrup and liquid smoke. Add the tempeh cubes and toss to coat all of the cubes. 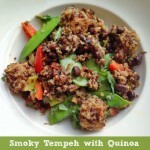 Marinate the tempeh in a bowl, making sure they are all covered, while you prepare the quinoa. Stir the cubes around a few times to make sure they are all well marinated. Bring 2 cups of water with a dash of salt to a boil. Add your rinsed quinoa, then reduce heat to a simmer. Cover and simmer until the water is absorbed, 15-18 minutes. When done, remove from heat and let sit. When quinoa is done and sitting, melt the coconut oil in a large saute pan over medium-high heat. Add the tempeh, without the marinade sauce, evenly into the pan. Set the marinade sauce aside for later. Cook the tempeh for a few minutes, or until lightly well browned on the bottom. Flip the cubes over one by one and cook the other side until lightly browned. Note: Do not walk away from the stove! I flip each little cube separately. I have burned the tempeh many times because I walked away. When the tempeh is done, remove it from the skillet and transfer to a plate. Add a few teaspoons of oil to the pan and stir in the bell pepper, snap peas, scallion and garlic. Sauté until the veggies begin to soften, about 3 minutes. Add the cooked quinoa and black beans to the pan, along with the reserved marinade. Then add the tempeh and toss again. Serve topped with fresh cilantro.